I didn’t quite know what to expect of today, all I could think of was that we had to leave Manila early, before sunrise if possible. It was 5:30 in the morning, 30 minutes pass me and my friend’s meet-up time. Where was she? I thought as I anxiously stirred the unsavory 3-in-1 Wendy’s coffee mix in the cup. I wished they served brewed, but as a traveler I have learned on many journeys that you just have to make the most of what you have. Apparently, this Wendy’s branch was the most secure place for me to wait for my friend in a somewhat unsafe area during an unsafe time of day. A few minutes later I see her through the glass doors and with a breathe of relief I tell myself, “Pahiyas Festival here we come!” I’ve never been to Lucban, Quezon, but based on some online reading I knew it would take 3-4 hours to get there. After a hurried breakfast Janel, my friend and I walked toward the congested bus terminals on the corners of Buendia and Taft Avenue intersection. It was pass 6:00 in the morning, the rush-hour crowd was building and it felt safer to walk outside. The next bus bound for Sta. Cruz would leave in 30 minutes so we quickly booked our tickets. 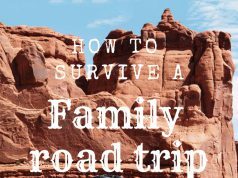 Halfway through the trip, I was beginning to feel numb from the airconditioning. Janel who came from her evening shift immediately dozed-off after we left the terminal. With no one to talk to, I amused myself by watching the vast rice fields and small towns along the way. An hour or so later, our bus arrived at Sta. Cruz, and we found our way toward the jeepney terminal in front of SM Mall. An incredibly long queue welcomed us to our dismay, but still determined to experience the Pahiyas festivities we queued in line accordingly. After an hour, we finally got to board a jeepney and endured another hour of windy, bumpy travel on the large galvanized jeep that took us to the town of Lucban. Janel and I decided on a quick day trip because of schedule constraints, although an overnight stay in town would have given us more time to explore. Also, we considered hostel rates are very high during the festival and availability was scarce thus the final decision to go on a day trip. I have always wanted to attend Pahiyas Festival and this was my chance. 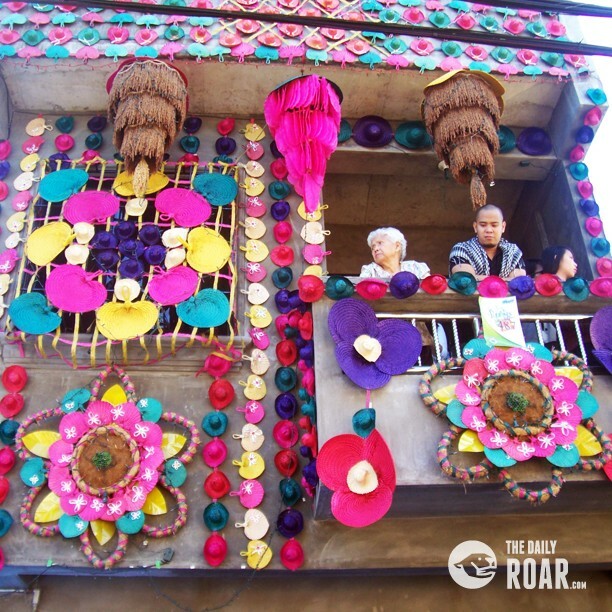 The Pahiyas Festival is a colorful, warm and happy time in the town of Lucban, Quezon. The town thrives on agriculture and celebrates the harvest once a year on May 15th on the death anniversary of San Isidro Labrador, (Saint Isidore the Laborer) – a Catholic Saint who lived in Madrid, Spain in the 12th century. San Isidro was a farmer and lived among the poor in rural Spain. He is known for his acts of generosity towards fellow laborers and to animals. He is revered as the patron saint of farmers. The festival is a week-long activity but on May 15th, the main road was closed-off and we had to walk some 500 meters to the town center. It was a pleasant walk though as Janel and I joined the growing crowd of tourists. Along the way we were met by street vendors selling souvenir shirts, colorful puppets, rice pastries and the much craved “Lucban Longganisa,” a tasty local sausage, rich in spice and flavor. The Lucban Longganisa is expensive in Manila, unfortunately, when we were ready to purchase some later that day, the stocks were gone. Apparently, the demand did not meet the supply on that busiest day of the festival. Moving deeper into the crowd, I finally caught sight of the colorful houses adorned with flowers and lined with all kinds of crops shaped into animals, hats or baskets. The most important decorative material used is “Kiping,” and it is produced from rice paste. I was impressed particularly by a house that displayed four giant sunflowers. 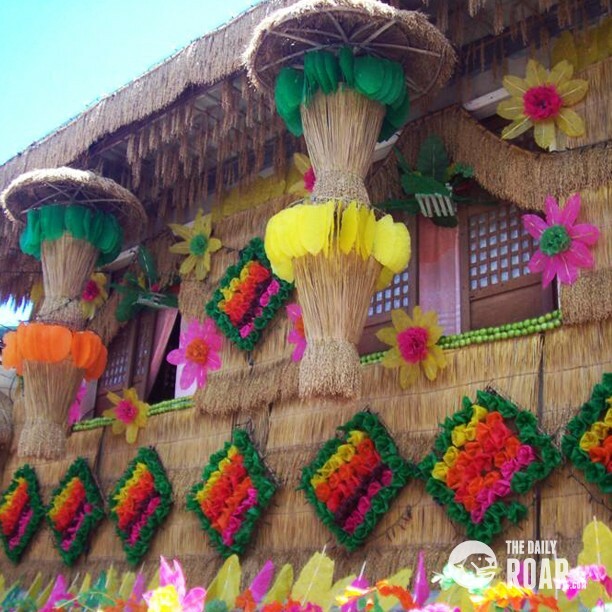 The artists used “bilao” and “banig” shaped into petals and painted bright yellow and orange to frame the words “VIVA SAN ISIDRO LABRADOR, PAHIYAS FESTIVAL.” A bilao is the Philippine version of a winnowing basket, and a banig is a woven sleeping mat made of pandan leaves or seagrass. With the summer heat it wasn’t an easy feat to course through the thick and busy crowd. We came across some street entertainment and bought some local food along the street market. I tried the famous “pancit habhab,” the town’s noodle specialty, although I didn’t feel it lived up to its reputation. It tasted just like any other Pancit dish in manila or perhaps since I got this one from a stack that appeared to be mass produced, it probably wasn’t the best in town. Food feasting is such a pleasure during Philippine festivals. Some residents would usually open their homes and “their kitchen” to neighbors or visitors from afar. It is a gesture of hospitality and generosity. Although, it is not done by all, you will likely chance upon a home with open doors for the hungry traveler. We were lucky enough to be welcomed into two homes where the kind homeowners served us lunch and later dinner. The highlight of the festival is the awarding of the most creatively designed house. 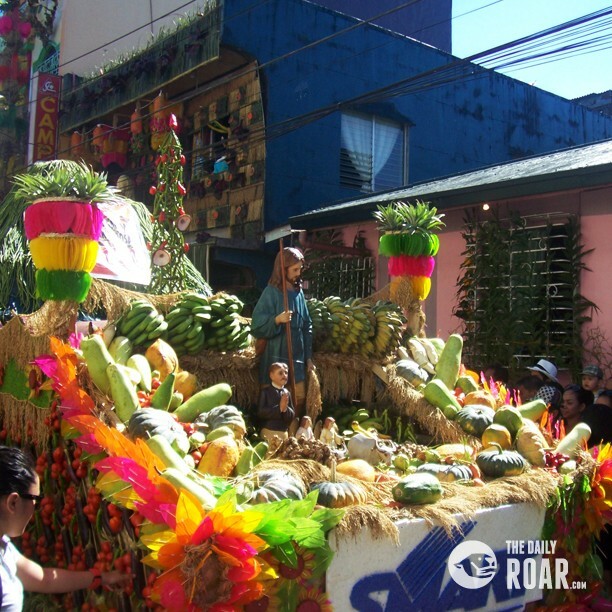 A mass in honor of St. Isidore is held in the morning, followed by a parade showcasing floats made from a variety of crops, models in gowns embellished with crop yield and various school bands. We spent a long hot afternoon under the sun, not wasting a moment to immerse ourselves in the celebration. By the time the sun set I could say that – We came, we saw and we conquered. I would gladly return next year to do it all over again. Next articleHot and crispy, banh-trang-nuong the number one food during a chilly night.